Lawn sprinkler systems are an important part of keeping your property looking beautiful and healthy. Lakeview Landscaping, Inc. will custom design a lawn sprinkler system that will meet the needs of your specific landscape and property. Our process takes into consideration the type of grass growing on your lawn as well as the type of plants you have growing on your property and their specific watering patterns. For example, if you have a garden area with vegetables growing in the summer, we want to be sure to have enough sprinkler heads there to cover the entire area and ensure that your plants are well-watered. We will install your timer in a location that is convenient for you and we will show you how to use your system to maximize its potential. Your timer will usually be set to water in the early morning hours to get the most water pressure and to avoid the evaporation that inevitable occurs when watering later in the day. Lakeview Landscaping, Inc. makes sure that your sprinkler system is in complete working order each spring with our sprinkler turn-on service. We make certain that your pipes are free and clear of any cracks or corrosion that may sometimes happen when systems are not properly winterized or have been installed for many years. 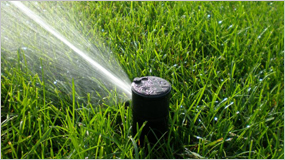 We also make sure that your sprinkler heads are working properly and are in the correct position to maximize watering. Should we find an issue in your system, our dedicated team of professionals will fix the problem before turning on your system for the first time that season. Often times homeowners neglect to properly winterize their sprinkler systems, turn on their systems in the spring without proper inspection first or just have damaged sprinkler heads. These are all scenarios that require repair by a professional. Lakeview Landscaping, Inc. will get to the root of the problem without having to remove your entire sprinkler system in the process. You may need upgrades or add-ons to your system, especially if you have recently changed the layout of your landscape, added different design elements to your landscape, or have new areas of plants, trees and flowers that would require more watering. Our process makes repairs simple and easy, with most being completed in just one day. Most sprinkler systems really take care of themselves throughout the season of their use. Many homeowners forget about their system and neglect to properly winterize it when the cold weather approaches. It is very important to properly winterize your system and blow out your pipes before the water has time to freeze and cause major problems. When the system is properly winterized, the chance of finding a problem in the spring time is greatly reduced. Our system for winterizing takes each portion of your sprinkler system into account individually. When we are done with the winterization process, you can rest a bit easier, regardless of the harsh temperatures and elements outside. When you own a sprinkler system it is of the utmost importance that you maintain a clean water supply at all times. Backflow prevention is the key to keeping your water supply clean and safe. Sometimes there is a discrepancy in the pressure of your system, which causes the water to flow in the wrong direction. Contaminants can find their way into your clean water supply and make your family and pets very ill. This can easily be prevented with the installation of a backflow preventer. Lakeview Landscaping, Inc. is NYS Certified to install and repair backflow preventers. If you currently have an irrigation system, chances are you already have a backflow preventer installed, but it needs to be periodically tested and maintained to ensure that chlorine, pesticides or fertilizers entering your water supply. The health and safety of your family is important. Schedule your backflow test with Lakeview Landscaping, Inc. today.